Anyone remember those giant cookie cakes they sold at the bakery kiosks in the mall? I used to beg my dad to get me one anytime we were there. He always said no. What 9 year old needs an entire cake to themselves? It never stopped me from asking though. Well I'm not nine years old anymore. I'm nine PLUS twenty. 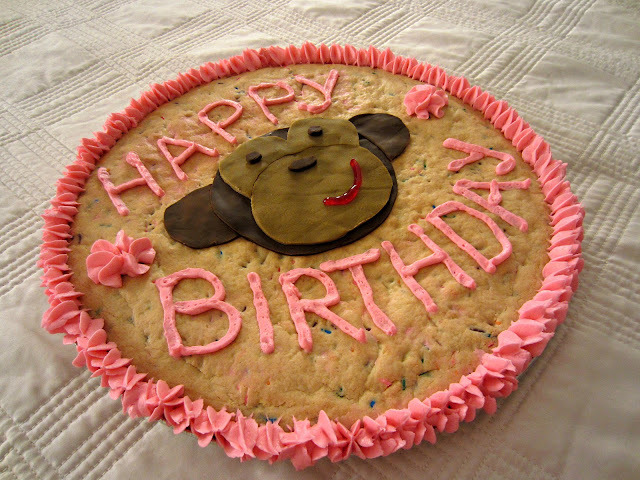 So I can have a frickin' cookie cake anytime feel like it. So I made one. And it was delicious. Soft, chewy and filled with yummy little rainbow sprinkles. And then I made another. For a sweet little girl named Kira. 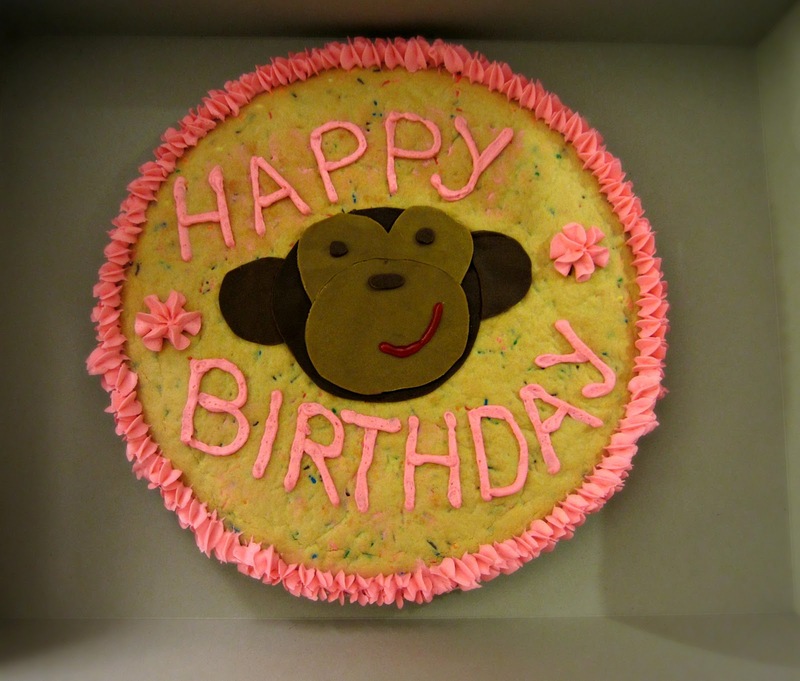 Oh, and did I mention the cute little fondant monkey face? Kira just loves monkeys so I felt it only appropriate. In your mixing bowl first cream together the butter and sugar until light and fluffy. Add in the eggs one at a time while beating on low. Next add the almond extract and beat for 1 minute. Place all dry ingredients into the mixer mixing well until blended. Mix in rainbow sprinkles into the dough. Spread mixture into a lightly greased round cookie/pizza pan (yes. press it and spread it with your hands). Bake for 18-22 minutes or until center is cooked through and edges are golden brown. Let cool completely before frosting. I tinted some vanilla buttercream pink and went to town on this cookie cake. Please excuse my warped and slanted handwriting, it was my first attempt at it. I need clearly need practice. 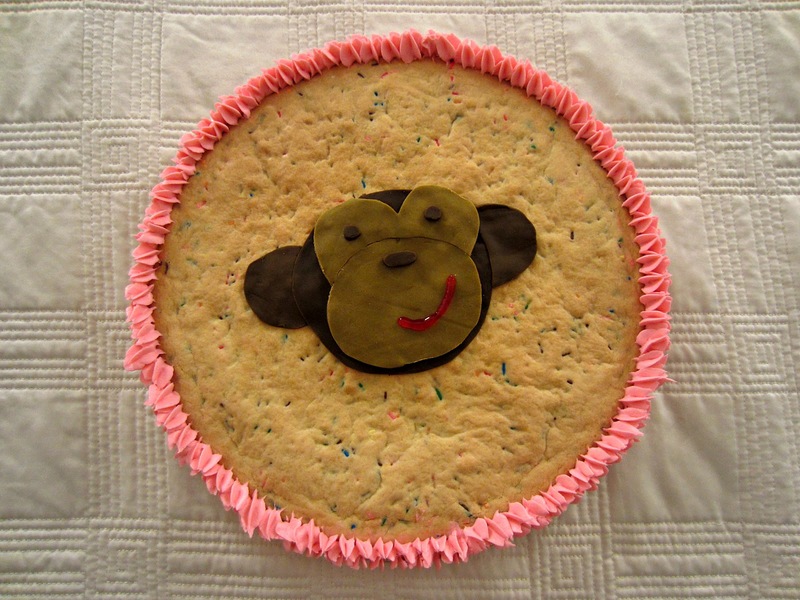 Next time I may just try a chocolate chip cookie cake.